Are you crafty? Do you sell your wares? Gearing up for the gifting season, us crafters are scrambling to finish up our own projects before taking and completing orders; hopefully earning a little extra cash in the process. If you’re anything like me, that is. My orders list is only growing and I think I need to take the next two weeks off just to get it all completed. It’s definitely a love/hate relationship. If you are looking to sell your handmade goods, it is inevitable that you second guess yourself on pricing. What is enough, what is too much? Do not undervalue your work, skill OR your time. If your prospective buyer can not find the value in your item, move on honey because someone else will. Crochet (my preferred craft) takes time to learn and time to master. It is a skill that other people do not have. If they did, they would be crocheting their own gifts, now wouldn’t they? Pricing handmade items should not be a mystery or a guarded secret. Listed below are the most common questions I get regarding pricing. Remember that buyers that understand the cost of both the materials and your time will pay you what the item is worth. I have heard all kinds of formulas for pricing your handmade items, but I’ll tell you what is easiest and what works for me. I set my price at 3x the cost of materials. (sometimes 2x depending on difficulty of the pattern/project) I use the “regular” price, even if I used a coupon and it was on sale. For example, if I needed two skeins of yarn for a particular scarf, and the yarn is $5 regular price, that is $10 in materials. I would charge $30 for the scarf. 1. I enjoy (insert your craft here) so I don’t need to earn a lot from it. I enjoy crocheting myself, but if I get twenty orders for the same hat, I can guarantee you that by the time I finish #6 I’m going to hate that freakin’ hat with 14 more to go. Charge what it is worth because if you don’t you’ll hate yourself with every single stitch you make. Been there, baby. If you’re making them to make them and the item does not sell well, you could always offer a “sale” but it is hard to raise your prices if you start too low. 2. I don’t think people are going to pay that much. If people don’t value your work, that is not your problem; it is theirs. 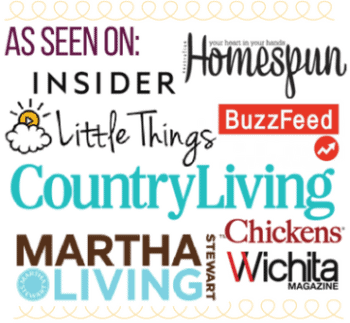 If you find that you’re not receiving many orders, try branching out, post for-hire listings in virtual yard sale groups or post more on your Etsy page or on your personal Facebook page. 3. Always request half payment up front. I can not even begin to tell you how many times I’ve had buyers back out on me, or “forget” that they ordered the week before. This is exactly why I will not go buy the yarn and supplies needed for a project unless: I implicitly trust the person (ie: my mom, lol!) OR I have received half-payment up front. Collect the other half when they pick up/you ship their order. This way if they DO back out or “forget”, you’re not out the cost of supplies. 4. I made it forever ago, so I’ll discount it to get rid of it. When you made the item is not the point. You made it, you bought the supplies for it, you sell it for what it is worth. Period. If a customer’s first experience with you involves you seriously undervaluing your work, they will have sticker shock the next item they purchase from you (at what the item is actually worth!). You are only hurting future sales if you do not charge what the item is worth – no matter when you made it. 5. I feel like I’m ripping people off if I charge what I think it’s worth. This is a skill that your buyer does not have. They are paying for your skill as well as the item. If they could do it themselves, they would (unless they literally do not have the time). Think of it as: I have a toothache, and I do not know how to fill the cavity myself (or pull it). Therefore, I go to the dentist and I pay the dentist for their time and work. This is not even a question when it comes to a professional; so why are you any different? It took time to learn your skill as well. 6. It didn’t take long to create this item, so I’m not going to charge much for it. 7. I already had the materials. So? It doesn’t matter when you bought the yarn, or where you got it (if it was gifted to you etc). It is the cost it would take to replace the item that you need to take into account. If you use this yarn now, you’ll need to spend $15 to replace that yarn tomorrow. Make sense? By staying consistent with your pricing, your repeat customers will be just that: repeat customers. Did I miss anything? Any other tips you’d like to share? I’m ready! Just leave them in the comments and we’ll continue the discussion. Hi Kimberly! I would say it depends on how much of each skein you are actually using...if you are using almost all of those 8 skeins (or even more than half), then absolutely price your piece on $40 in materials. Whereas, if you are using less than half of each skein, then I would maybe price at $20 in materials. Hope this helps. I definatly makes sense as to how to price now my question is, what if they provide the material? Should they be priced a little lower or not. And if there is left over material should you give it back ? If you bought a pattern and made an item to sell, can you add the price of the pattern in with the cost of materials and pass that cost onto the customer? Hi Donna! 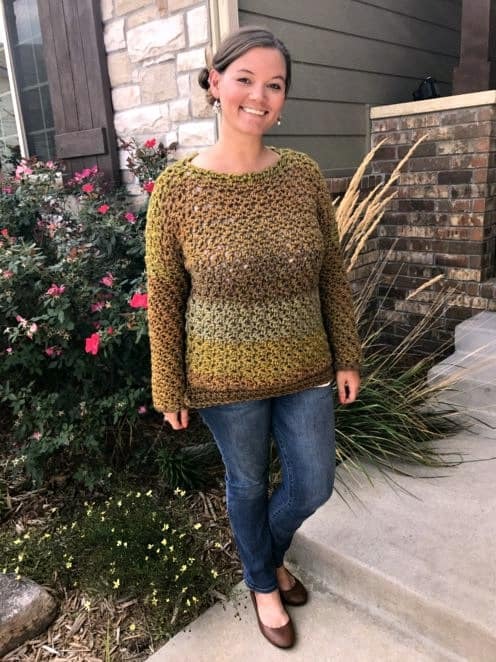 For me, it would depend on the situation...if it was a customer request that required the purchase of the pattern, and I didn't think I would use the pattern again, then yes, I probably would pass that cost onto my customer. However, if I bought a pattern for the specific purpose of making and selling, then I wouldn't. Hope this helps! Hi Ashley If the customer provides the wool, what is the best way to charge for an item? Hi Lori! I would figure up how much the materials are regular price and times that by 2 instead of 3...so if the wool is normally $10, then I would charge $20 for my time and skill. Hope this helps! Hi Pearl! I would calculate price based on the regular price of a full skein. Hope this helps! Hi there I recently came across ur blog. Your tips are amazing.i recently stepped into this world u can say couple of weeks. Really appreciate if u could help regarding how to manage orders. I just found your blog and I read and love all your tips and advices, thank you! This post doesn't factor in the administrative and marketing costs, nor depreciation, nor tax (if applicable). As soon as you start selling things, you have to spend time and effort on these tasks. Keeping track of projects, recording sales, tracking the due date for commissions, finding out if you have to pay tax, figuring out the postage-and-handling costs. Packing your work to mail to clients, finding the right box, labels and such, and actually going to the post office - that's the 'handling' part. I lump these and other similar tasks under 'administration'. Another cost I tend to label 'administrative' (but others would probably not) is the time and effort you spend getting better at your craft. Yes, it's fun to go to a knitters' circle! But (and especially if it's one that requires significant travel) the time and effort and materials you spend doing so can be, and maybe should be, part of your calculated prices. Every time you rent a table for a craft market, every minute you spend constructing and maintaining your website, every minute spent photographing. Time spent going through your books that track sales, and calculating which products sell at which craft market: all of this is marketing. And if you're going to be successful, you do it. Tax is annoying, but you need to make allowance for it. Where I am, if your hobby doesn't earn more than $X, we don't have to declare it. But $X+1 has to be declared, and they do assess the 'higher than $X' amount. One I didn't mention is improving your gear. Buying that lovely magnifier/lamp you've had your eye on. Replacing your hooks to the Clover hooks our hostess here likes. Subscriptions to magazines (and webzines, and pattern libraries...). All of that can be tracked and (if relevant to your laws) used to reduce taxes! Lastly: depreciation. Hooks get lost and break. Yarn bowls, bobbins, magnifying lamps, eventually need to be replaced. If you're someone who likes to laminate patterns, the laminator will break eventually. Everything has a lifespan. Make a guess about the lifespan per days (or hours, or weeks, or years) of use. Divide the replacement cost by the count of days. Round up, not down, and the divided cost to the cost of your product. (Admittedly, it is often less than a cent!) This kind of stuff is called 'overhead'. Your price should be no less than what Ashlei posted in this (wonderful) article, PLUS your overhead. Except that there is a part of marketing that can be pulling buyers to your product by deliberately underpricing some items. If you do that, slightly increase the prices of other items to allow for that marketing cost. Happy (and lucrative) crocheting! Maybe all of this is true, but this is the type of information one would learn in business school. If you decide to learn about the complicated processes of pricing, you would learn this as you go and adjust your pricing as your business grows. The rules posted above are for beginners just getting started, who may not even be going to craft shows just yet. Thank you for this!! Great information so glad I found you!!! 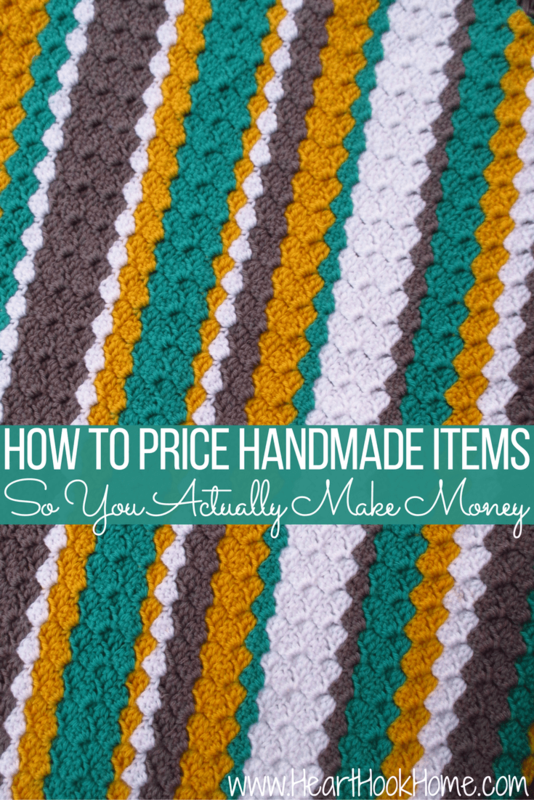 I'm glad I found your blog on pricing handmade items. Your formula sounds more logical. I tried another pricing guide and when I entered all the information the results was outrageous. Thanks again for sharing. I truly thankful for the pricing information. It has been years when I sold anything. I gave up on selling what I made. When I made anything it was given as a gift. I also have been trying your foundation stitch. Still working on it. Wish I had some of your ideas when I was younger '20 + years'. Hi Fran! I'm so glad this helped you. I find that if I loosen up a bit on those foundation rows (even just chaining!) it helps to make the finished project look much cleaner. Thanks for stopping by! This is great! Thank you so much for this article!! I still do have that fear that if I charged $150 for a blanket, or $120 for a mermaid blanket, let's say, that nobody would buy it or they'd think that I was being ridiculous. Lol! Or even a hat for $20/25! One day I'm sure I'll get over it, but right now I've been having a hard time trying to figure out pricing and this was perfect!! Thank you!! And btw, I love the PCC! Just finished one for my 18 yo for xmas!!!! Now I want one!!!! Lol!! Hello!!! My mom is making a prayer shawl for a baby blanket . and the customer provided the yarn,,, she is frogging it cuz its too long,,, how much should she charge for it? I love everything you had to say! 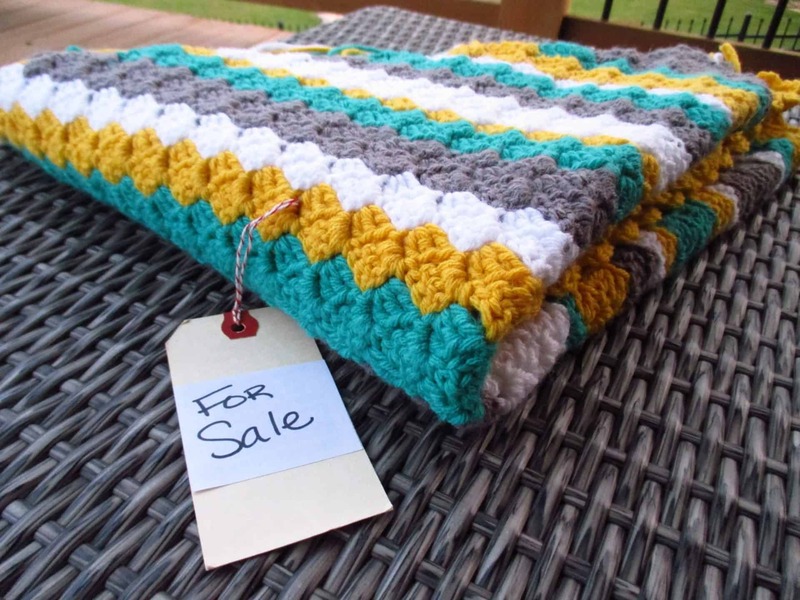 I'm trying to venture out into the world of selling my crochet work as an income. It's daunting, but I'm excited to see what I'm capable of doing. What would you charge for products that are small and take much less than a skien of yarn? I don't want to overprice, but my husband says I deserve a good payment for the time I put into what I do. If I make 15 things out of one skien, how can I price it so that I'm not asking too much from my customers? Hey Sarah! I'm so glad this is helpful! :D For smaller things, like the Aldi quarter keeper keychains I make, I can get 10-12 out of one $5 skein, but I charge $5 each (including the quarter). If the materials are too cheap to use the formula, I charge by how long it takes to make, at what I'd like to earn per hour. Within reason, of course. Hope that helps! I am very glad I came upon this post! I crocheted a very amazing nativity scene for my mother in law and was thinking about making more to try and sell them. The only problem I am having is what to price it at if/when I do get around to making another set. The materials we not bad a bad price at all. But, it took TIME to make them. If I were to use your formula for pricing the set, then I would be neglecting the time I put into it. How to calculate what to price items at that are more "time consuming" than they are for the cost of materials? Hello! On instances like that, where it takes hours and hours but the materials were cheap, I'll do a dollar amount per hour worked (plus materials) instead. I keep the whole total within reason, of course. Hope that helps! What do you charge when the customer provides the pattern and materials for an item they want crocheted and all you have to do is put in your time and work to make it? Hopefully this won't sound bad but what I would add is how it actually sometimes hurts and offends the rest of your fellow handmade community when you undercharge for things. I work hard to make my items and I carefully choose higher end yarns ect and sometimes when I go on our local handmade buy sell trade fb page I'll see similar items others have made and they aren't even charging enough to cover supplies let alone their time. If I were to offer my product there my chances of selling anything is slim when customers can get "the same" crocheted hat for $8 from another handmade seller . Am I making sense? I think we as a community of creative people should have pride in what we can do and what we offer! Not devalue it. I would also add that if people are having a hard time selling their items I find it helpful to adjust the yarn (supplies) im using, the colors im offering, and re evaluate if there is a demand for the particular product I'm offering. You can see what's popular and what's selling by visiting other handmade communities online like Etsy for example. anyway great post thanks for writing it! It's helpful and also validating for me. Thanks so much for this blog! I was kind of stressing about what to charge someone that asks me to make them something, thinking I ask too much. These points make perfect sense! How do you handle materials cost increases? Example: "I Love This Yarn" from Hobby Lobby was $1.99 eight years ago and is now $3.99. Or what if a great yarn is discontinued? (I'm not talking about running out of yarn mid-project, I'm asking about offering a product and running out of a supplier.) Example: My local Walmart had an inexpensive, amazingly soft, no-pill acrylic for two years and then the brand disappeared from the face of the earth. I have not run into that yet, actually. Great point though! I suppose at that point I would up the prices a bit to compensate. Thank you for bringing that up!